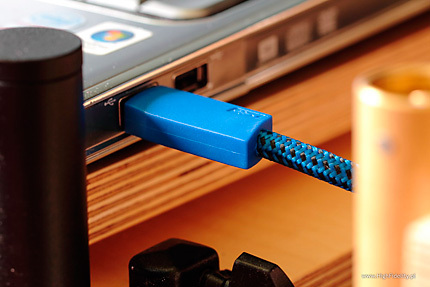 USB cables are still a “novelty”, although we use them for years connecting a printer, camera, mouse, keyboard, etc, to our computer, sometimes also portable players. So the USB cable became a part of the computer landscape. But the cables were never as stressed as ever before. What is an USB cable? Such a cable is composed of two runs of cables in shields (four wires in total – the same number as there are connectors in the USB plugs) – one of those runs is used to transmit the signals, the other one is used for the 5VDC power supply. What does this mean? That one of the electromagnetic fields is disrupted by the other. This also means quite substantial vibrations of the structure, especially at the maximum power draw allowed by USB standards, which is 500mA, or 0.5A! Besides that, as we can read in the company materials, and what we can instinctively feel, a computer generates a lot of high frequency noise which comes out together with the voltage. This noise influences the closely placed signal cable, inducing its reflection in it. This influence is fought by shielding the cable runs. But this is only a half-measure. Acoustic Revive has a much better solution to the problem. It is strange, that nobody before AR did not come to such a simple idea! It is sufficient to separate those two cables to get rid of most of the problems. We cannot separate them completely – on the side of the receiver, the USB DAC, or an USB-S/PDIF converter, we have one input, usually a type B (square) one. So when we split the cable to two separate runs, they have to converge there. 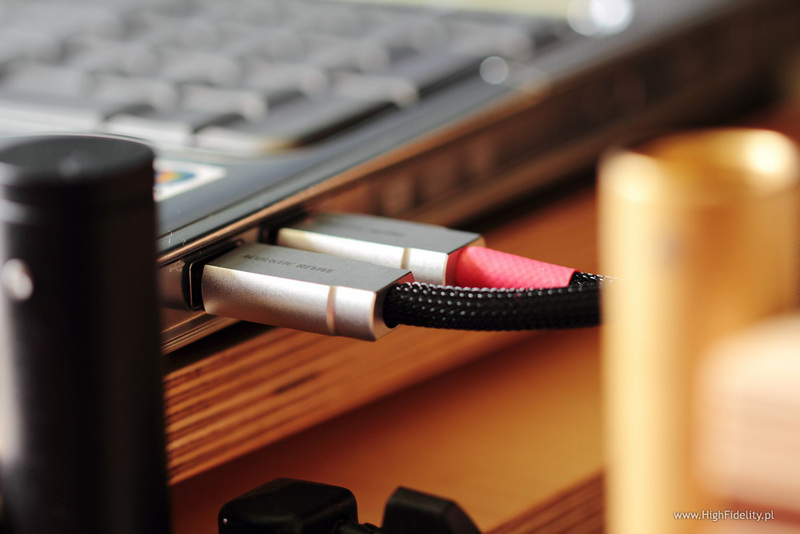 It can be different on the transmitter side – most PCs, even laptops, have more than one USB port. So on that side, the cables can have separated plugs. 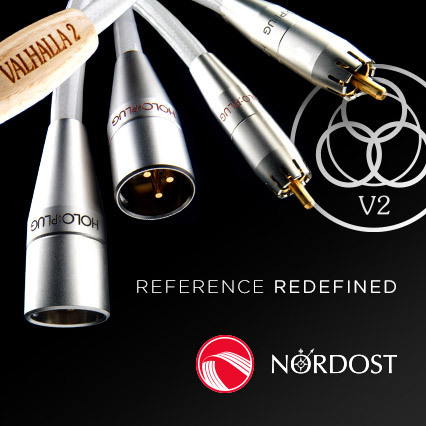 Mr. Yoshi Hontai, representing Acoustic Revive outside of Japan, send us both types of cables – the USB-1.0SP (with two plugs on the transmitter side) and USB-5.0PL (with single plugs). Both are made from two, separated, cables – one leads the power, while the other one the signal. The digits in the name represent the length of the cable. Anti-vibration platforms RST-38 and RAF-48 HERE. Power strip + power cable AC RTP-4eu ULTIMATE + POWER REFERENCE HERE. Disc Demagnetizer RD-3, Grounding Conditioner RGC-24 HERE. 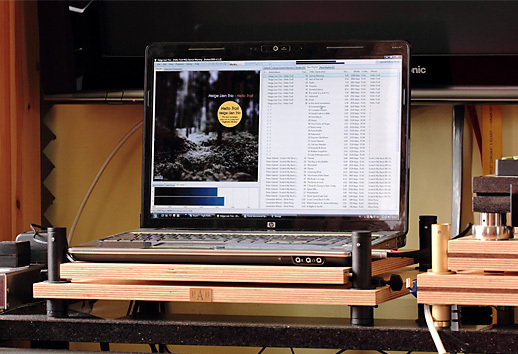 Audio Accesory - T-TOC Records High Quality Data Master Comparison, TDVD-0002, DVD-R, ripy 16/44,1, 24/96, 24/192 WAV. Barb Jungr, Love Me Tender, Linn Records, AKD 255, FLAC 24/88,2. Brian Eno, Craft On A Milk Sea, Warp Records, WAV 24/44,1. Chris Connor, Witchcraft, Atlantic/Warner Music Japan, WPCR-25166, CD. Depeche Mode, Ultra, Mute, DMCDX9, Collectors Edition, CD+DVD. Freddie Hubbard, Open Sesame, Blue Note/Audio Wave, AWMXR-0012, XRCD24. Harry Belafonte, Belafonte at Carnegie Hall, RCA/Sony Music, 7783322, LPCD-M2 Mastering, No. 0953, HQCD. John Coltrane, Blue Train, Blue Note/Classic Records, HDAD 2010, DVD-V 24/96 + DVD-A 24/192 + FLAC. Stan Getz & Joao Gilberto, Getz/Gilberto, Verve/Lasting Impression Music, LIM K2HD 036, K2HD CD. Suzanne Vega, Close-Up, Vol 1. Love Songs, Amanuensis Productions/Cooking Vinyl, COOKCD521, CD. Zbigniew Namysłowski, Open, Polish Jazz, vol. 74, SX2539, pliki „master”, 16/44,1, 24/96 WAV. Japanese versions of the CDs are available on CD Japan. I used the Acoustic Revive cables in the test of all DACs with USB input I made during the last five months. As it turned out, the length of the 5m long USB-5.0PL is a problem for some of them – the computer signals then a problem with installing drivers and reports a fault of the hardware. This is a problem of the receiver, and not the cable, but eliminates the usage of such long cables in that case. I think, that about 25% of the devices had this problem. I never had any problems with the USB-1.0SP. Already the first impression made by the cables, with their construction, looks and overall sturdiness is good. The same thing can be said about the sound – despite the fact, that some engineers and people related to the computer branch tell, that an USB cable should have no influence on the sound. But it is enough to prepare a sensible listening session to hear that it does have influence, and a big one. We should remember, that short, quick listening sessions can be deceiving. And although the so called “first impression” does count very much, but only when we know where to search for from the very beginning and we do not need any time for accommodating to a given sound. In case of USB cables, or actually in MY case, it was different with the USB cables. Changes brought by the USB cable are clear and unanimous. I know the standpoint of fellow engineers and I respect them. In short it tells that a well made digital receiver, and a USB receiver even more, should counteract jitter and minimize all RF noise brought by the USB cable. Yes I know, that this is a strong standpoint. But as usual I believe most of all in that what I hear – surprisingly often observations made engineers revise theories and look at the problem from a different side. I think, that in case of digital connection, USB being one of those, it will also happen. I did not yet come across a coherent description of the changes, with which we deal in such cables. And I am not talking about modification brought by individual cables, converters, etc, but about an attempt of capturing something more general, something what – in my opinion – repeats each time, and what defines the requirements for the better cables. A lesser cable (converter, USB DAC) washes out the sound stage. This is probably the strongest signature of bad USB sound. This is not the kind of washing out we know from less good loudspeakers, but something deeper – there is some kind of diffusion, as if the basic sound, that what describes contours of the sounds would have been dispersed around the room. This results in a less stable and often unclear contours of the sound. There is also no such thing as depth of the stage – everything is flattened and less dynamic.